कैसिनी ने "मोतीयों की माला" के रूप में उपनामित मेघाकृतियों की एक श्रृंखला प्रेक्षित की, जो उत्तरी अक्षांश में पाई गई। These features are cloud clearings that reside in deeper cloud layers. ग्रह से 12 लाख किलोमीटर की दूरी पर मुख्य छल्ले से परे विरल फोबे वलय है, जो कि अन्य छल्लों से 27 डिग्री के कोण पर झुका हुआ है तथा, फोबे की तरह, प्रतिगामी रीति में परिक्रमा करता है। पैंडोरा और प्रोमेथियस सहित, शनि के चंद्रमाओं में से कुछ, छल्लों को सीमित रखने और उन्हें बाहर फैलने से रोकने के लिए सैफर्ड En चांद के रूप में कार्य करते है। पान और एटलस शनि के छल्लों में निर्बल, रैखिक घनत्व तरंगों के कारण है that have yielded more reliable calculations of their masses. ↑ Brainerd, Jerome James (नवम्बर 24, 2004). 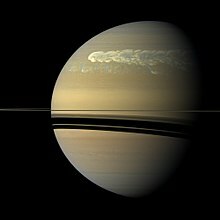 "Characteristics of Saturn". The Astrophysics Spectator. मूल से 5 अक्टूबर 2011 को पुरालेखित. अभिगमन तिथि 5 जुलाई 2010. ↑ "General Information About Saturn". Scienceray. जुलाई 28, 2011. मूल से 5 अक्टूबर 2011 को पुरालेखित. अभिगमन तिथि 17 अगस्त 2011. ↑ Brainerd, Jerome James (अक्टूबर 6, 2004). "Solar System Planets Compared to Earth". The Astrophysics Spectator. मूल से 5 अक्टूबर 2011 को पुरालेखित. अभिगमन तिथि 5 जुलाई 2010. ↑ Dunbar, Brian (नवम्बर 29, 2007). "NASA – Saturn". NASA. मूल से 5 अक्टूबर 2011 को पुरालेखित. अभिगमन तिथि 21 जुलाई 2011. ↑ Brainerd, Jerome James (अक्टूबर 27, 2004). "Giant Gaseous Planets". The Astrophysics Spectator. मूल से 5 अक्टूबर 2011 को पुरालेखित. अभिगमन तिथि 5 जुलाई 2010. ↑ "The Planets ('Giants')". Science Channel. जून 8, 2004. ↑ Piazza, Enrico. "Saturn's Moons". Cassini, Equinox Mission. JPL NASA. मूल से 5 अक्टूबर 2011 को पुरालेखित. अभिगमन तिथि 22 जून 2010. ↑ Munsell, Kirk (अप्रैल 6, 2005). "The Story of Saturn". NASA Jet Propulsion Laboratory; California Institute of Technology. मूल से 22 अगस्त 2011 को पुरालेखित. अभिगमन तिथि 7 जुलाई 2007. ↑ "Saturn". BBC. 2000. मूल से 21 अगस्त 2011 को पुरालेखित. अभिगमन तिथि 19 जुलाई 2011. ↑ अ आ इ ई "Saturn". National Maritime Museum. मूल से 5 अक्टूबर 2011 को पुरालेखित. अभिगमन तिथि 6 जुलाई 2007. ↑ "Structure of Saturn's Interior". Windows to the Universe. मूल से 21 अगस्त 2011 को पुरालेखित. अभिगमन तिथि 19 जुलाई 2011. ↑ Saturn. Universe Guide. Retrieved 29 मार्च 2009. ↑ Hamilton, Calvin J. (1997). "Voyager Saturn Science Summary". Solarviews. मूल से 5 अक्टूबर 2011 को पुरालेखित. अभिगमन तिथि 5 जुलाई 2007. ↑ Watanabe, Susan (मार्च 27, 2007). "Saturn's Strange Hexagon". NASA. मूल से 1 फरवरी 2010 को पुरालेखित. अभिगमन तिथि 6 जुलाई 2007. ↑ अ आ "Warm Polar Vortex on Saturn". Merrillville Community Planetarium. 2007. मूल से 5 अक्टूबर 2011 को पुरालेखित. अभिगमन तिथि 25 जुलाई 2007. ↑ Godfrey, D. A. (1988). "A hexagonal feature around Saturn's North Pole". Icarus. 76 (2): 335. डीओआइ:10.1016/0019-1035(88)90075-9. बिबकोड:1988Icar...76..335G. ↑ Sanchez-Lavega, A.; Lecacheux, J.; Colas, F.; Laques, P. (1993). "Ground-based observations of Saturn's north polar SPOT and hexagon". Science. 260 (5106): 329–32. PMID 17838249. डीओआइ:10.1126/science.260.5106.329. बिबकोड:1993Sci...260..329S. ↑ "New images show Saturn's weird hexagon cloud". MSNBC. दिसम्बर 12, 2009. मूल से 5 अक्टूबर 2011 को पुरालेखित. अभिगमन तिथि 29 सितंबर 2011. ↑ Ball, Philip (मई 19, 2006). "Geometric whirlpools revealed". Nature. डीओआइ:10.1038/news060515-17. 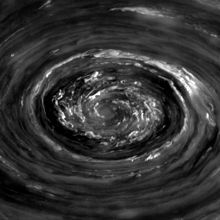 Bizarre geometric shapes that appear at the centre of swirling vortices in planetary atmospheres might be explained by a simple experiment with a bucket of water but correlating this to Saturn's pattern is by no means certain. ↑ Aguiar, Ana C. Barbosa; Read, Peter L.; Wordsworth, Robin D; Salter, Tara; Hiro Yamazaki, Y. (2010). "A laboratory model of Saturn's North Polar Hexagon". Icarus. 206 (2): 755–763. डीओआइ:10.1016/j.icarus.2009.10.022. अभिगमन तिथि 20 फ़रवरी 2013. नामालूम प्राचल |month= की उपेक्षा की गयी (मदद) Laboratory experiment of spinning disks in a liquid solution forms vortices around a stable hexagonal pattern similar to that of Saturn's. ↑ "NASA catalog page for image PIA09187". NASA Planetary Photojournal. मूल से 5 अक्टूबर 2011 को पुरालेखित. अभिगमन तिथि 23 मई 2007. ↑ "Huge 'hurricane' rages on Saturn". बीबीसी न्यूज़. नवम्बर 10, 2006. मूल से 5 अक्टूबर 2011 को पुरालेखित. अभिगमन तिथि 29 सितंबर 2011. ↑ "NASA Sees into the Eye of a Monster Storm on Saturn". NASA. नवम्बर 9, 2006. मूल से 5 अक्टूबर 2011 को पुरालेखित. अभिगमन तिथि 20 नवंबर 2006. ↑ अ आ "A Hurricane Over the South Pole of Saturn". NASA. NASA. नवम्बर 13, 2006. अभिगमन तिथि 1 मई 2013. ↑ Carolina Martinez, NASA (10 नवम्बर 2006). Cassini Image Shows Saturn Draped in a String of Pearls. प्रेस रिलीज़. http://www.nasa.gov/mission_pages/cassini/media/cassini-20061011a.html. अभिगमन तिथि: 3 मार्च 2013. ↑ अ आ McDermott, Matthew (2000). "Saturn: Atmosphere and Magnetosphere". Thinkquest Internet Challenge. मूल से 5 अक्टूबर 2011 को पुरालेखित. अभिगमन तिथि 15 जुलाई 2007. ↑ "Voyager – Saturn's Magnetosphere". NASA Jet Propulsion Laboratory. अक्टूबर 18, 2010. मूल से 5 अक्टूबर 2011 को पुरालेखित. अभिगमन तिथि 19 जुलाई 2011. ↑ Russell, Randy (जून 3, 2003). "Saturn Magnetosphere Overview". Windows to the Universe. मूल से 5 अक्टूबर 2011 को पुरालेखित. अभिगमन तिथि 19 जुलाई 2011. 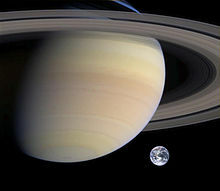 ↑ "Scientists Find That Saturn's Rotation Period is a Puzzle". NASA. जून 28, 2004. मूल से 21 अगस्त 2011 को पुरालेखित. अभिगमन तिथि 22 मार्च 2007. ↑ Poulet F.; Cuzzi J.N. (2002). "The Composition of Saturn's Rings". Icarus. 160 (2): 350. डीओआइ:10.1006/icar.2002.6967. बिबकोड:2002Icar..160..350P. ↑ Shafiq, Muhammad (2005). "Dusty Plasma Response to a Moving Test Change" (PDF). मूल (PDF) से 8 नवंबर 2011 को पुरालेखित. अभिगमन तिथि 25 जुलाई 2007. ↑ "The Real Lord of the Rings". Science@NASA. February 12, 2002. मूल से 5 अक्टूबर 2011 को पुरालेखित. अभिगमन तिथि August 24, 2011. ↑ "Age and Fate of Saturn's Rings" (PD). Creation Concepts. अभिगमन तिथि 23 जुलाई 2011. ↑ NASA Jet Propulsion Laboratory (मार्च 3, 2005). "NASA's Cassini Spacecraft Continues Making New Discoveries". ScienceDaily. मूल से 5 अक्टूबर 2011 को पुरालेखित. अभिगमन तिथि July 19, 2011. ↑ Wall, Mike (जून 21, 2011). "Saturn's 'Ice Queen' Moon Helene Shimmers in New Photo". Space.com. मूल से 5 अक्टूबर 2011 को पुरालेखित. अभिगमन तिथि 19 जुलाई 2011. ↑ NASA (नवम्बर 30, 2010). "Thin air: Oxygen atmosphere found on Saturn's moon Rhea". ScienceDaily. मूल से 5 अक्टूबर 2011 को पुरालेखित. अभिगमन तिथि 23 जुलाई 2011. ↑ "Oxygen found on Saturn moon: NASA spacecraft discovers Rhea has thin atmosphere rich in O2". Daily Mail. नवम्बर 26, 2010. मूल से 5 अक्टूबर 2011 को पुरालेखित. अभिगमन तिथि 23 जुलाई 2011. ↑ "Saturn's Known Satellites". Department of Terrestrial Magnetism. मूल से 5 अक्टूबर 2011 को पुरालेखित. अभिगमन तिथि 22 जून 2010. ↑ "Cassini Finds Hydrocarbon Rains May Fill Titan Lakes". ScienceDaily. January 30, 2009. मूल से 5 अक्टूबर 2011 को पुरालेखित. अभिगमन तिथि 19 जुलाई 2011. ↑ "Voyager – Titan". NASA Jet Propulsion Laboratory. अक्टूबर 18, 2010. मूल से 5 अक्टूबर 2011 को पुरालेखित. अभिगमन तिथि 19 जुलाई 2011. ↑ "Evidence of hydrocarbon lakes on Titan". MSNBC. Associated Press. जुलाई 25, 2006. मूल से 5 अक्टूबर 2011 को पुरालेखित. अभिगमन तिथि July 19, 2011. ↑ "Hydrocarbon lake finally confirmed on Titan". Cosmos Magazine. जुलाई 31, 2008. मूल से 5 अक्टूबर 2011 को पुरालेखित. अभिगमन तिथि 19 जुलाई 2011. ↑ NASA (अप्रैल 21, 2008). "Could There Be Life On Saturn's Moon Enceladus?". ScienceDaily. मूल से 5 अक्टूबर 2011 को पुरालेखित. अभिगमन तिथि 19 जुलाई 2011. ↑ Pili, Unofre (सितंबर 9, 2009). "Enceladus: Saturn′s Moon, Has Liquid Ocean of Water". Scienceray. मूल से 5 अक्टूबर 2011 को पुरालेखित. अभिगमन तिथि 21 जुलाई 2011. ↑ "Strongest evidence yet indicates Enceladus hiding saltwater ocean". Physorg. जून 22, 2011. मूल से 5 अक्टूबर 2011 को पुरालेखित. अभिगमन तिथि 19 जुलाई 2011. ↑ Kaufman, Marc (जून 22, 2011). "Saturn′s moon Enceladus shows evidence of an ocean beneath its surface". Washington Post. मूल से 5 अक्टूबर 2011 को पुरालेखित. अभिगमन तिथि 19 जुलाई 2011. ↑ "Saturn > Observing Saturn". National Maritime Museum. मूल से 22 अप्रैल 2007 को पुरालेखित. अभिगमन तिथि 6 जुलाई 2007. ↑ अ आ इ "Starry Night Times". Imaginova Corp. 2006. मूल से 21 अगस्त 2011 को पुरालेखित. अभिगमन तिथि 5 जुलाई 2007. ↑ "Greek Names of the Planets". अभिगमन तिथि 14 जुलाई 2012. The Greek name of the planet Saturn is Kronos. The Titan Cronus was the father of Zeus, while Saturn was the Roman God of agriculture. See also the Greek article about the planet. ↑ Cessna, Abby (नवम्बर 15, 2009). "When Was Saturn Discovered?". Universe Today. मूल से 5 अक्टूबर 2011 को पुरालेखित. अभिगमन तिथि जुलाई 21, 2011. ↑ "The Pioneer 10 & 11 Spacecraft". Mission Descriptions. मूल से 30 जनवरी 2006 को पुरालेखित. अभिगमन तिथि 5 जुलाई 2007. ↑ अ आ "Missions to Saturn". The Planetary Society. 2007. मूल से 21 अगस्त 2011 को पुरालेखित. अभिगमन तिथि 24 जुलाई 2007. ↑ "Astronomers Find Giant Lightning Storm At Saturn". ScienceDaily LLC. 2007. मूल से 21 अगस्त 2011 को पुरालेखित. अभिगमन तिथि 27 जुलाई 2007. ↑ Pence, Michael (मार्च 9, 2006). "NASA's Cassini Discovers Potential Liquid Water on Enceladus". NASA Jet Propulsion Laboratory. मूल से 21 अगस्त 2011 को पुरालेखित. अभिगमन तिथि 3 जून 2011. ↑ Lovett, Richard A. (मई 31, 2011). "Enceladus named sweetest spot for alien life". Nature. Nature. डीओआइ:10.1038/news.2011.337. मूल से 5 अक्टूबर 2011 को पुरालेखित. अभिगमन तिथि 3 जून 2011. ↑ Kazan, Casey (जून 2, 2011). "Saturn's Enceladus Moves to Top of "Most-Likely-to-Have-Life" List". The Daily Galaxy. मूल से 21 अगस्त 2011 को पुरालेखित. अभिगमन तिथि 3 जून 2011. ↑ Shiga, David (सितंबर 20, 2007). "Faint new ring discovered around Saturn". NewScientist.com. मूल से 21 अगस्त 2011 को पुरालेखित. अभिगमन तिथि 8 जुलाई 2007. ↑ Rincon, Paul (मार्च 14, 2007). "Probe reveals seas on Saturn moon". BBC. मूल से 5 अक्टूबर 2011 को पुरालेखित. अभिगमन तिथि 26 सितंबर 2007. ↑ Rincon, Paul (नवम्बर 10, 2006). "Huge 'hurricane' rages on Saturn". BBC. मूल से 5 अक्टूबर 2011 को पुरालेखित. अभिगमन तिथि 12 जुलाई 2007. ↑ "Mission overview – introduction". Cassini Solstice Mission. NASA / JPL. 2010. मूल से 21 अगस्त 2011 को पुरालेखित. अभिगमन तिथि 23 नवंबर 2010. ↑ "Massive storm at Saturn's north pole". 3 News NZ. April 30, 2013. ↑ अ आ Schmude, Richard W Jr (2003). "Saturn in 2002–03". Georgia Journal of Science. मूल से 16 अक्टूबर 2007 को पुरालेखित. अभिगमन तिथि 14 अक्टूबर 2007. "शनिधाम" जाँचें |url= मान (मदद).